The elements of texture and form, shape and garden occupy my thoughts more and more as I add plants and the garden matures. I really like the textures of plants in the shade bed, but the main bed along my patio is starting to look a bit messy. I’m not sure if it’s because the dwarf blue spruce is so slow to grow unlike the grasses, which are getting very big and therefore the balance is off, or because there are so many spillers in the garden and that’s creating some visual chaos. Either way, I’m exploring the themes of texture, balance and color as I consider moving things around next year. I never thought much about texture until I started gardening. 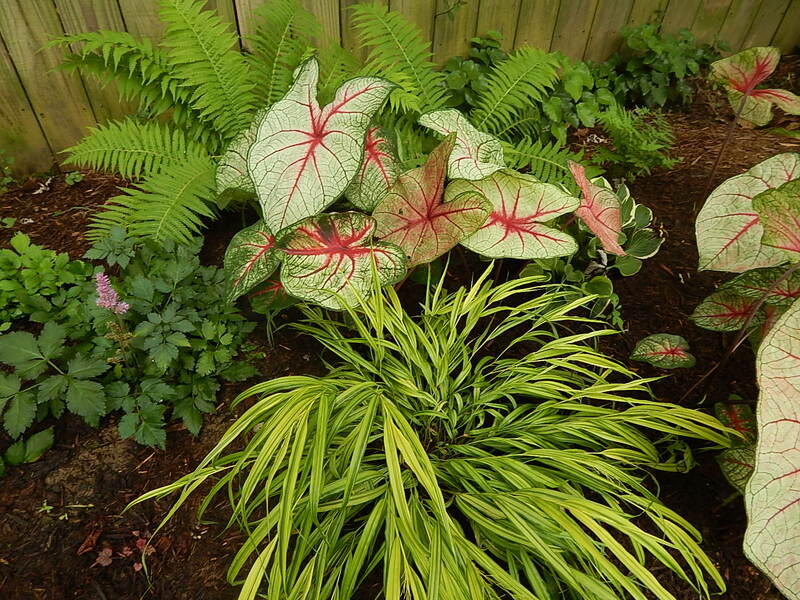 Texture creates interest and interplay among plants. 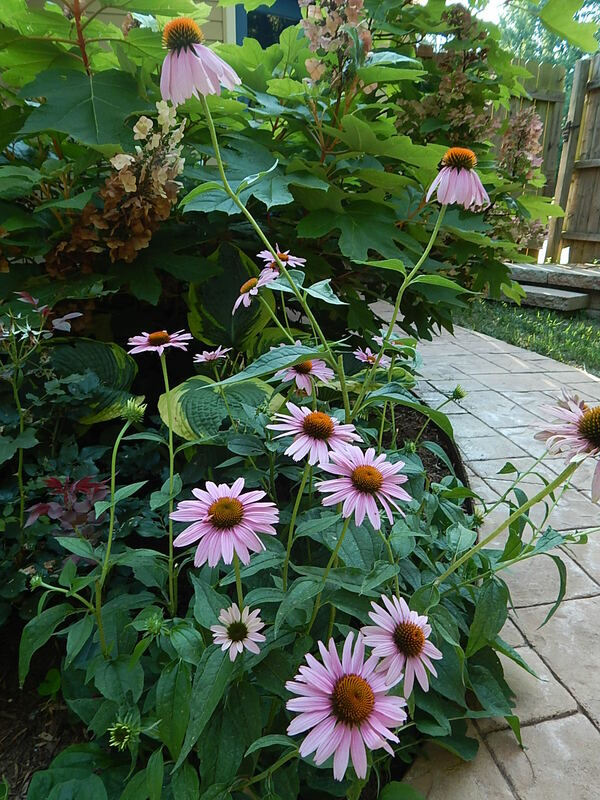 In the world of texture, contrast seems to be key, and there are a couple of ways to achieve texture in garden design. Placing plants with contrasting leaf shapes near each other. Placing plants with contrasting bloom shapes near each other. Properly combine fine, medium and coarsely textured plants in the garden and you’ll get visual interest. Too much texture and you can end up with visual chaos. And there’s both tactile and visual textures to consider.Yikes. (When I initially started planning my gardens, this overwhelmed me, not to mention other considerations of size, shape and color.) Most plants have medium texture. I typically use coarse and fine textured plants as a great way to achieve accents.Then I try and spice things up through complementary or contrasting colors of plants. The finely textured leaves from Russian sage (Perovskia atriplicifolia) complement the medium-textured leaves of rudbeckia. The bloom shapes from all three are small, medium and large. And the grayish-green Russian sage also provides a color contrast to the green of the other plants. Proper texture pairings provide lots of interest and result in pleasing vignettes. This is not as simple as you might imagine. It’s probably one reason why gardeners move plants around year after year. Balance combines with texture and creates unity. I like the balance in my shade bed, achieved by repeating astilbe, hosta, fern and Japanese forest grass (Hakonechloa) throughout its linear shape. 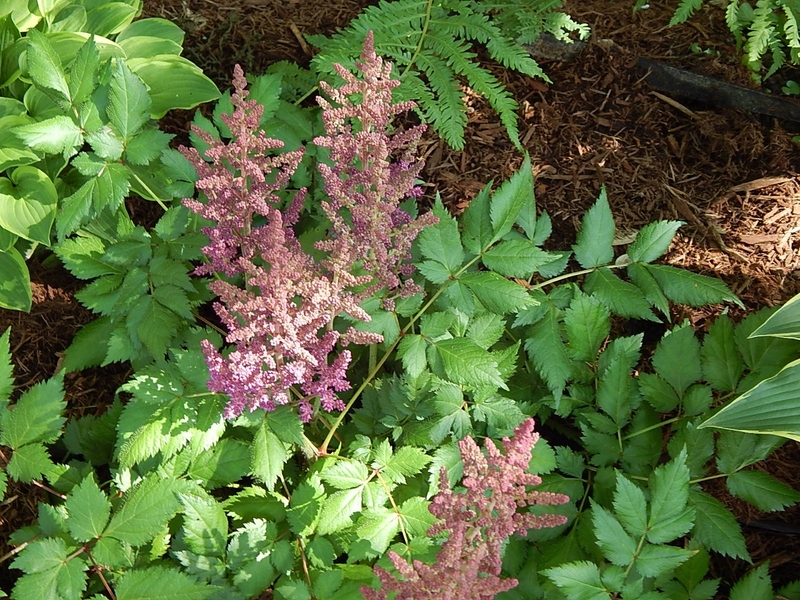 The astilbe’s bottle brush-shaped bloom lends coarse texture in contrast to the smooth leaves of the Japanese forest grass. Visual interest if further achieved through contrasts in color and leaf shape. In the combination below a trifecta of color, shape and texture unite to create a pleasing vignette at the Missouri Botanical Garden. 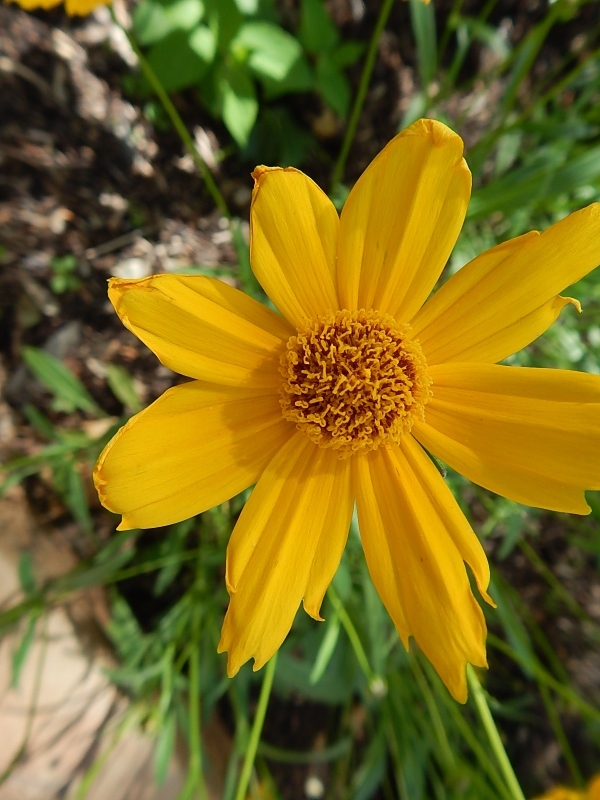 The coarse brown center of the yellow rudbeckia and the soft, finely textured brown plume from an ornamental millet pair up, as do the daisy-like petal shape and the contrasting shape of the brown plume. And last but not least, brown and yellow make a complementing color contrast. With so many varieties, succulents are a great way to add texture to a container. Soft rosette shapes combine with coarse texture, and the grayish hues of all the plants create color harmony in a succulent display at the Toronto Botanical Garden last summer. I love the fuzzy texture of the echeveria next to the crassula princess pine. 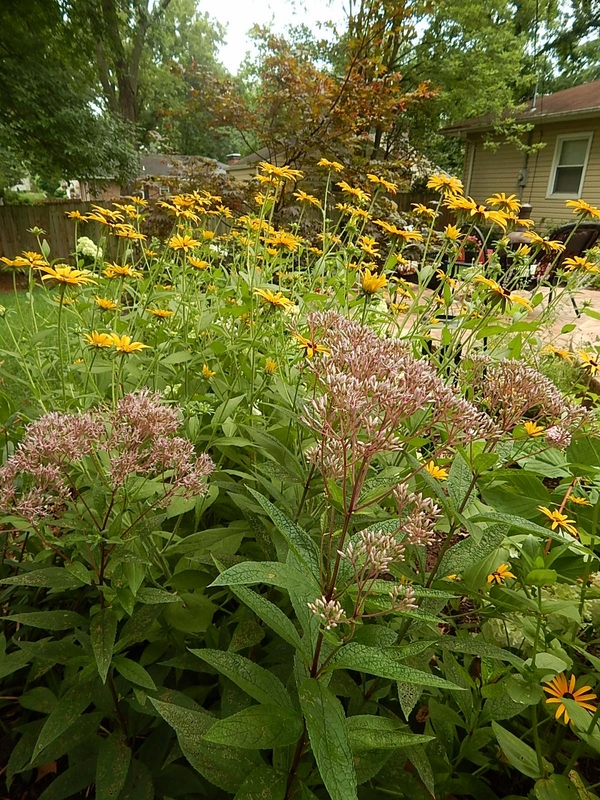 How important is texture in your garden? 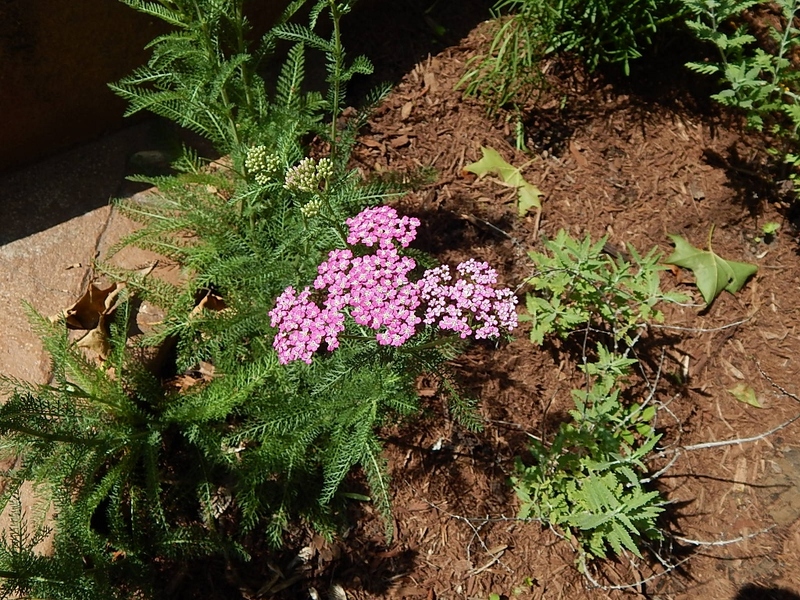 And what plants are you incorporating for textural variety? Categories: How To, Musings | Tags: astilbe, fern, hosta, Japanese forest grass, joe pye weed, little lamb hydrangea, Little Lime hydrangea, Ornamental millet, Rudbeckia, Russian sage, St. Louis, succulents, tall garden phlox, zebra grass | Permalink. 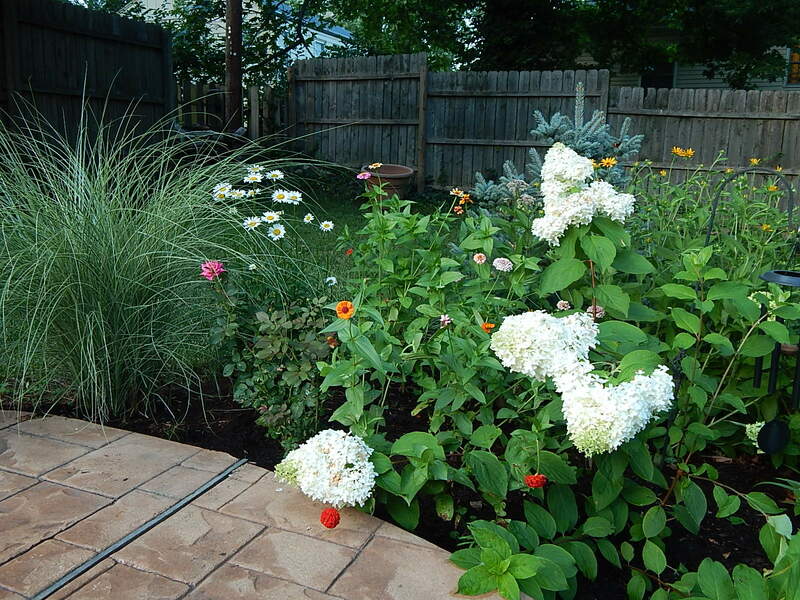 Categories: Musings | Tags: black-eyed susans, Hakonechloa, Japanese forest grass, little lamb hydrangea, Ostrich fern, roses, Russian sage, tall garden phlox | Permalink. Categories: Musings | Tags: alchemilla mollis, Asiatic lily, astilbe, black-eye susan, caladium, canna, Colorado blue spruce, Hakonechloa, hosta, Japanese forest grass, joe pyeweed, little lamb hydrangea, oakleaf hydrangea, ribbon grass, roses, Rudbeckia, Russian sage, shasta daisy, Stella De Oro daylily, Tickseed coreopsis, veronica, zinnia | Permalink. 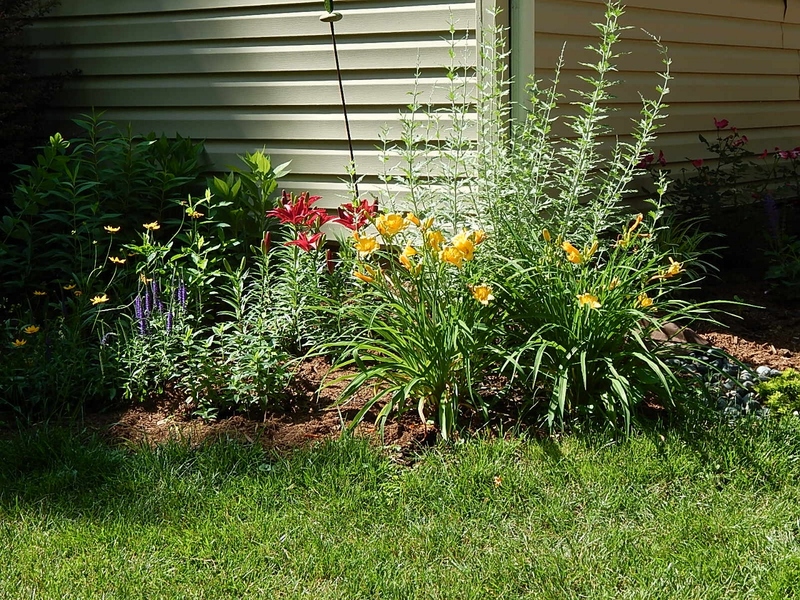 Categories: Musings | Tags: Asiatic lily, astilbe, Audubon Society, blooming, oakleaf hydrangea, Oertel's rose yarrow, Rosa Redrazz, Russian sage, shasta daisy, Stella De Oro daylily, Tickseed coreopsis, Veronica salvia | Permalink. 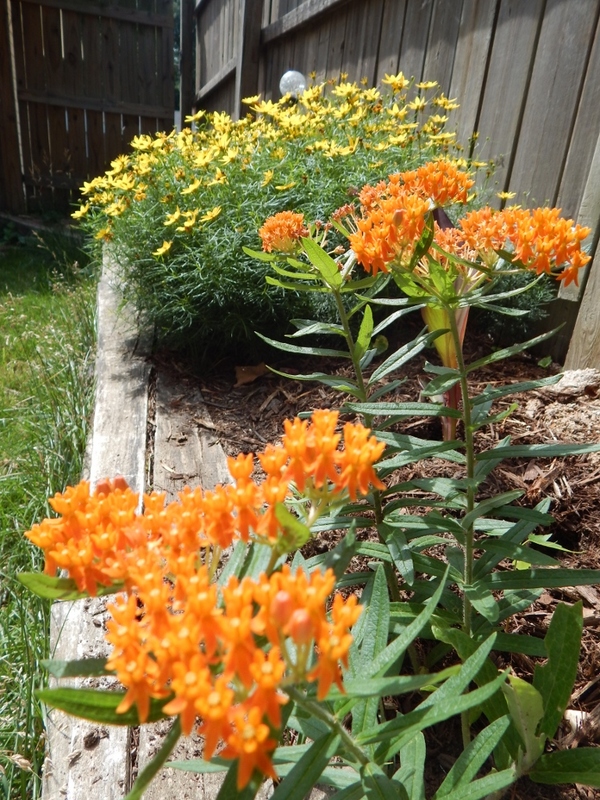 Life in the backyard is abuzz with growth! 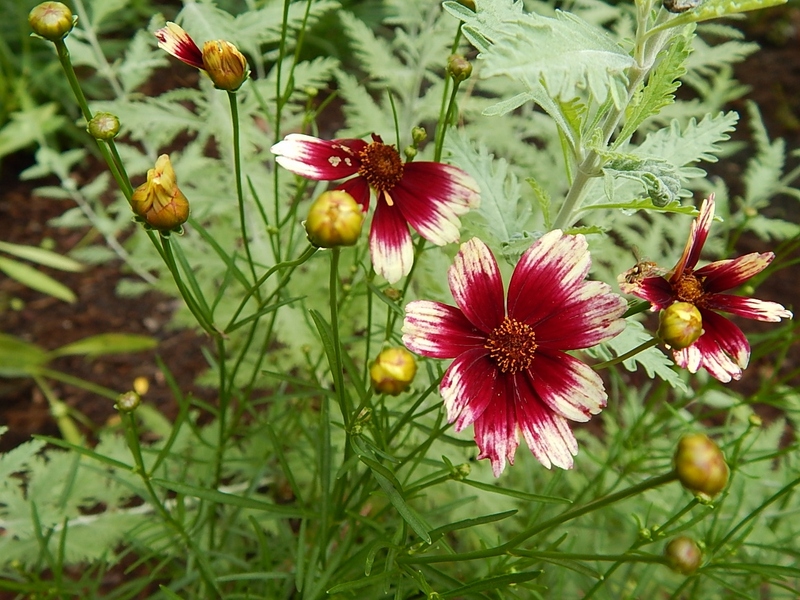 Just one month ago, perennials were just beginning to push their way through the soil. 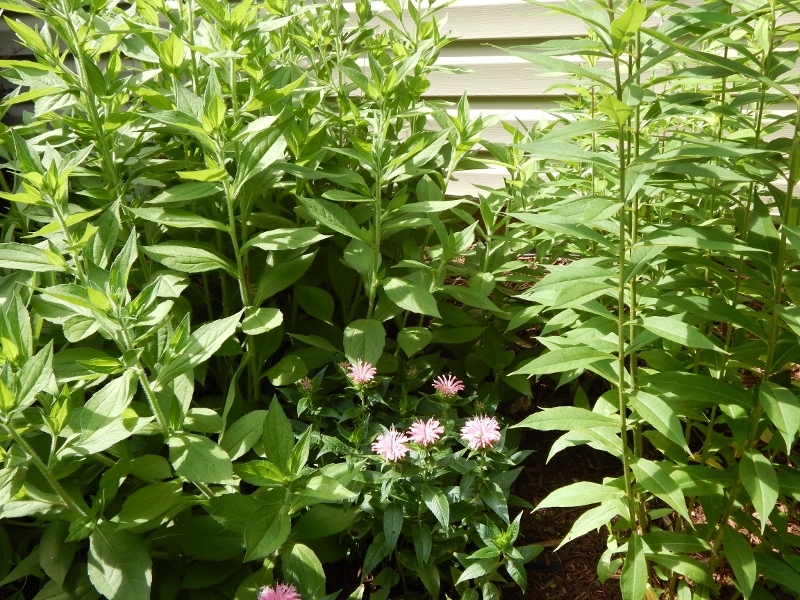 Take a look and see for yourself the plant progress in my St. Louis garden. This bed beneath the family room window and bordering the patio, looked rather barren on March 29. The small bit of green is Meadow Sage. I had yet to trim back the roses and still need to add mulch. There are four KnockOut rose shrubs in this bed, three of them planted last year. This bed faces east and gets lots of morning sun as well as sun from the south. Mother Nature is not the only one who has been busy. 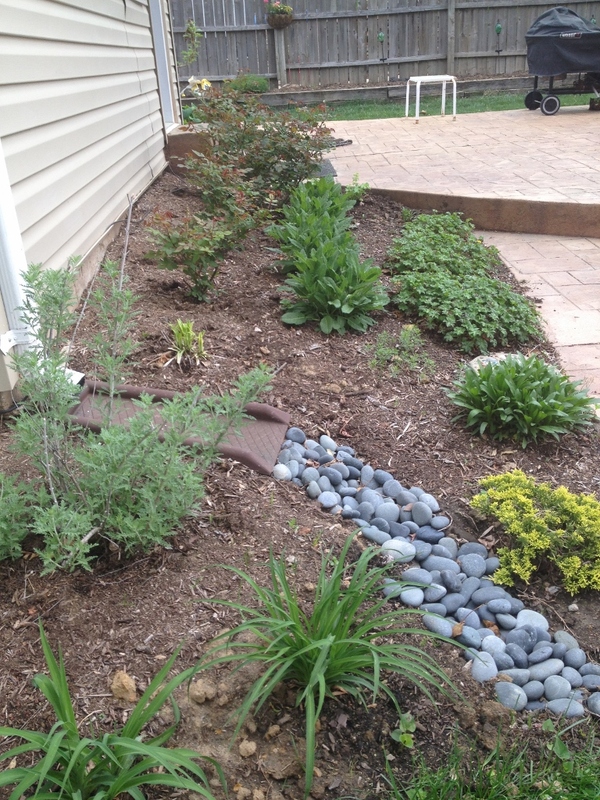 I have added the rocks to better direct the drainage from the downspout, cleaned out the bed and trimmed the roses. 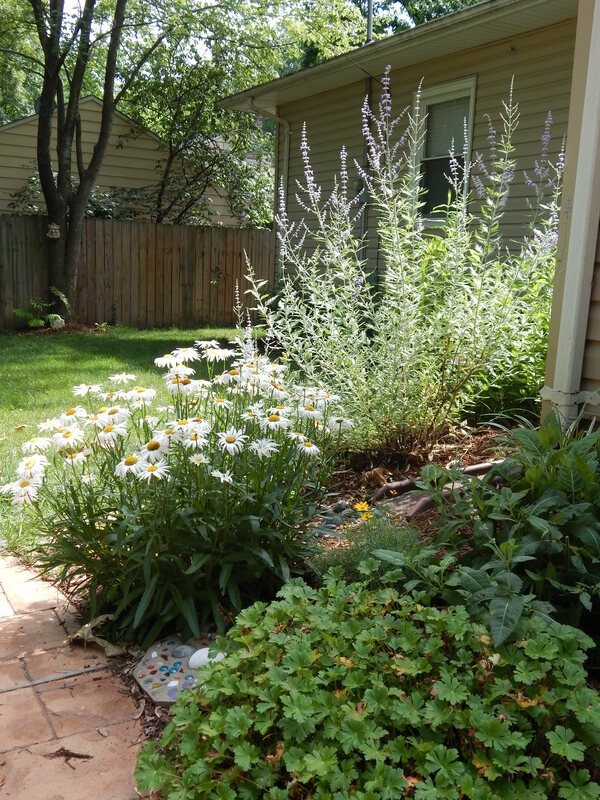 I have added a few plants as well, although the vast majority are perennials planted over the past three years. This is one of my favorite beds. Everything I have put in this bed has been happy, happy, happy as Phil would say on Duck Dynasty. In addition to the roses and Mianacht salvia (salvia x sylvestris), there are Cranesbill Biokova Karmina (geranium x cantabrigiense) which edge the bed. 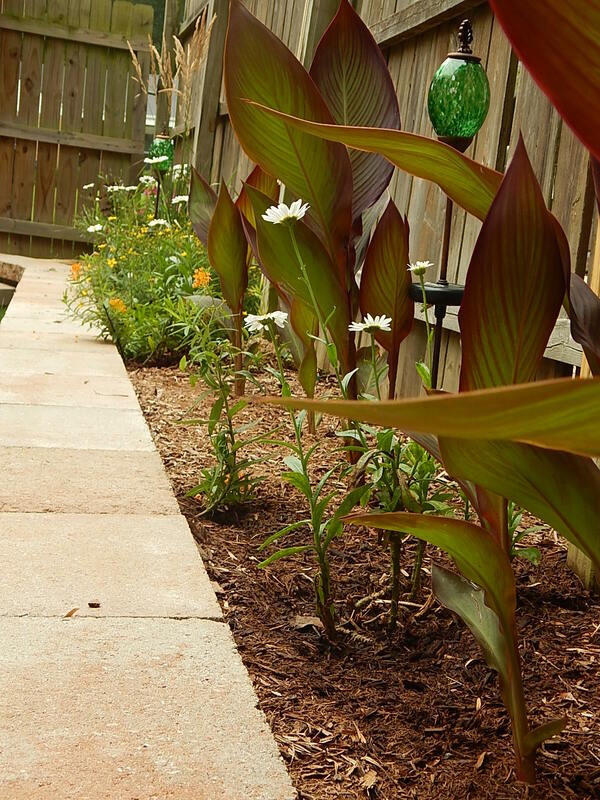 These mounding plants have wonderful year round interest, their leaves turning deep green to crimson red in the fall and winter. In early summer they are filled with small rose-hued flowers. 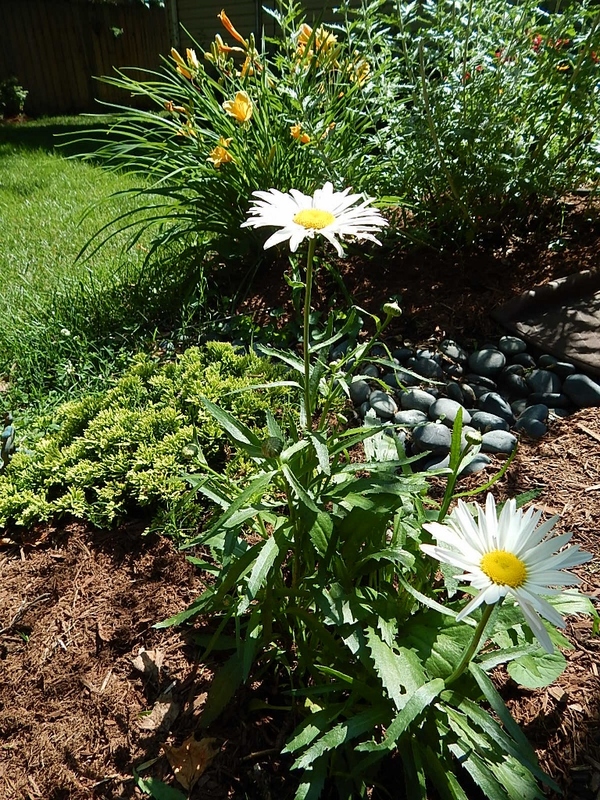 Filling in the bed are Shasta daisy(Leucanthemum × superbum), variegated lily turf (liriope muscari), threadleaf coreopsis and new this season, Lady’s Mantle (Alchemilla mollis). I added the lady’s mantle to the north end of the bed, near the door, to bring some yellow to that end of things. I also transplanted a small and struggling shasta that had been in a bed near the fence. Anchoring the bed near the rocks on the south end is a low-to-the ground, creeping juniper (Juniperis horizontalis). This evergreen has lots of yellow in, which complements the hot pink of the roses and brightens the deep purple of the salvia. I also like this bed because it wraps around to the south, which gets gobs of sun. It begins its southern turn where the Russian Sage (Perovskia atriplicifolia) is anchored. 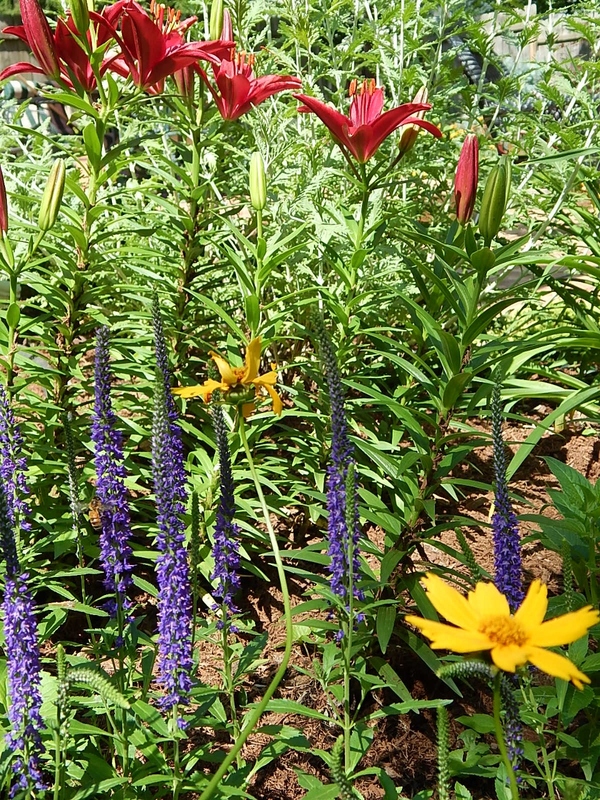 I added two Stella D’Oro lilies(Hemerocallis) to play off the color in the juniper and contrast with the cool lavender of the Russian Sage. 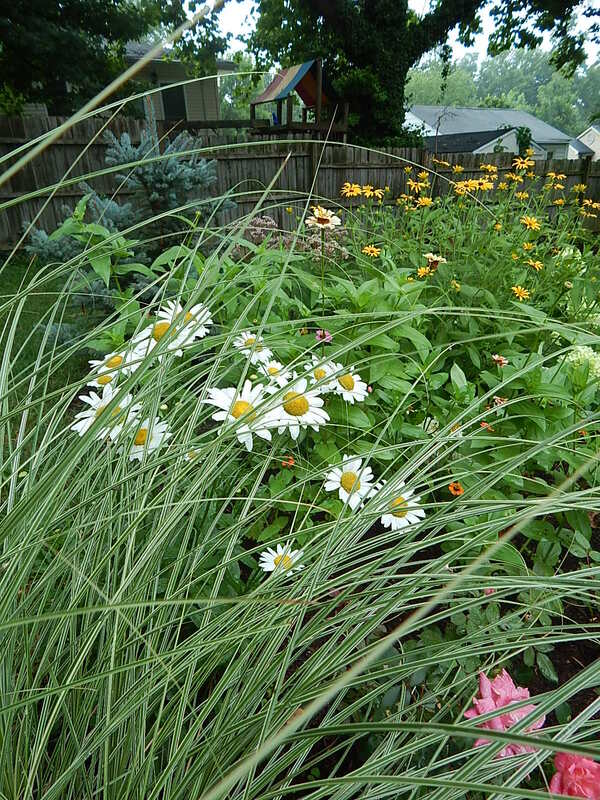 This small grouping is a nice segue to the south-facing part of the bed. I’ll share more of that in another post. Categories: Musings, Plants | Tags: coreopsis, cranesbill geranium, Knockout roses, lily turf, mainacht, Russian sage, salvia, shasta daisy, stella d'oro | Permalink. 1. Tall garden phlox. 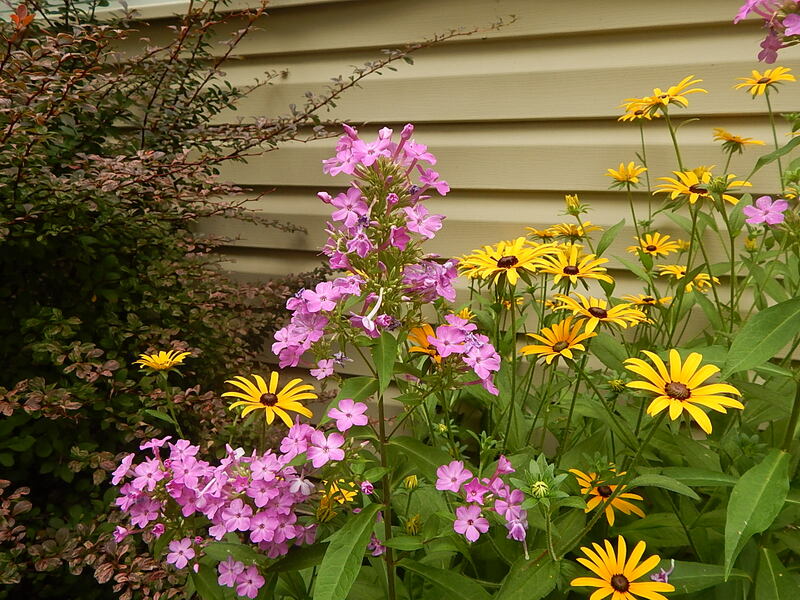 The color range available and the lovely “eyes” of tall garden phlox make my heart skip a beat. These tall wonders are first on my list for an after-work garden stroll. 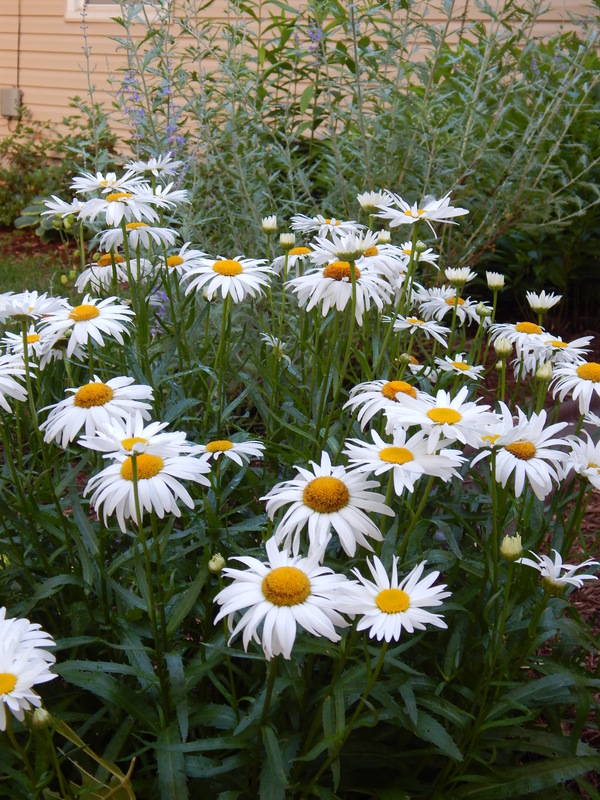 They are fragrant and mingle delightfully among the Russian sage, bee balm and Stella de Oro daylily. While I enjoy them most in the garden, they hold up well in a cut arrangement gracing the dining table. 2. 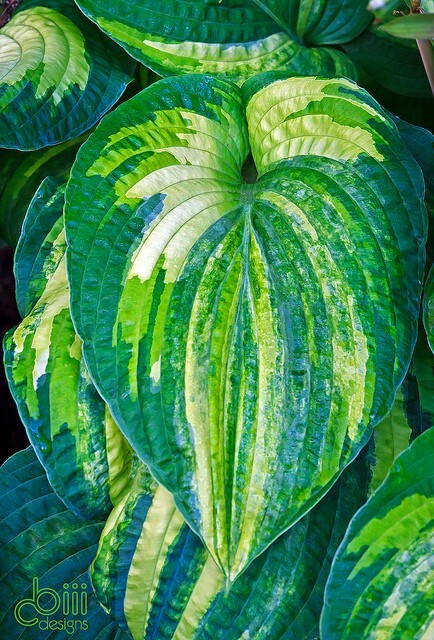 Hosta, “Dorothy Benedict”. This beauty seems to have it all. It looks like a painting with streaks of bright green-yellow, blue-green and green-green interspersed with white. Leaves are textured, edges are smooth. Pop it into the shade garden and gaze away. What’s not to love? Oh yeah, the price (I’ve seen Dorothy Benedict quoted at $200-$500). 3. Lady’s Mantle (Alchemilla mollis). Chartreuse-hued plants work well in a wide range of applications in the garden. Contrast this plant with cool blue-tinged foliage or the deep purples of “Mainacht” salvia. 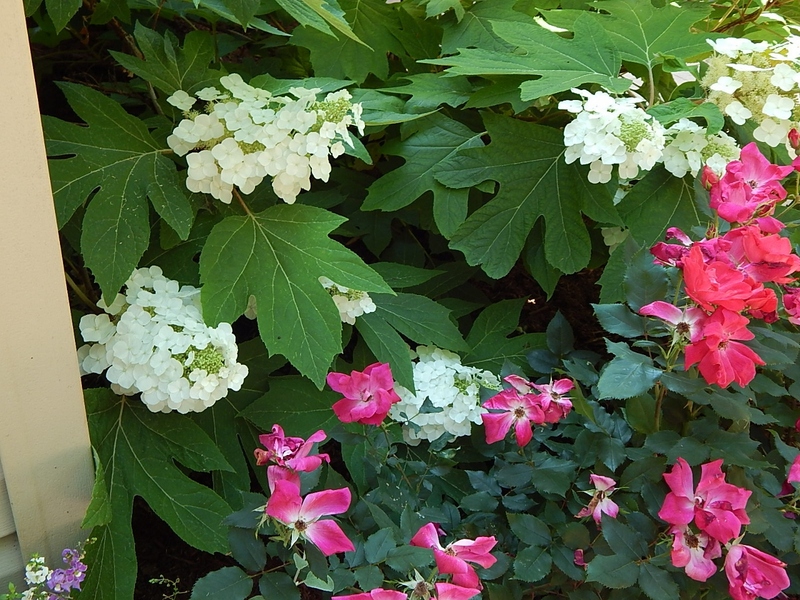 Or complement lady’s mantle with bursting colors such as bright pink Knockout roses. The old-fashioned girl will make its way into the garden this year. 4. Kobold Gayfeather (Liatris spicata). I like spikes, and this plant delivers. Commonly known as blazing star, it pushes forth a stalk that really is a bunch of rounded flower heads that are fun to watch unfold from the top down. 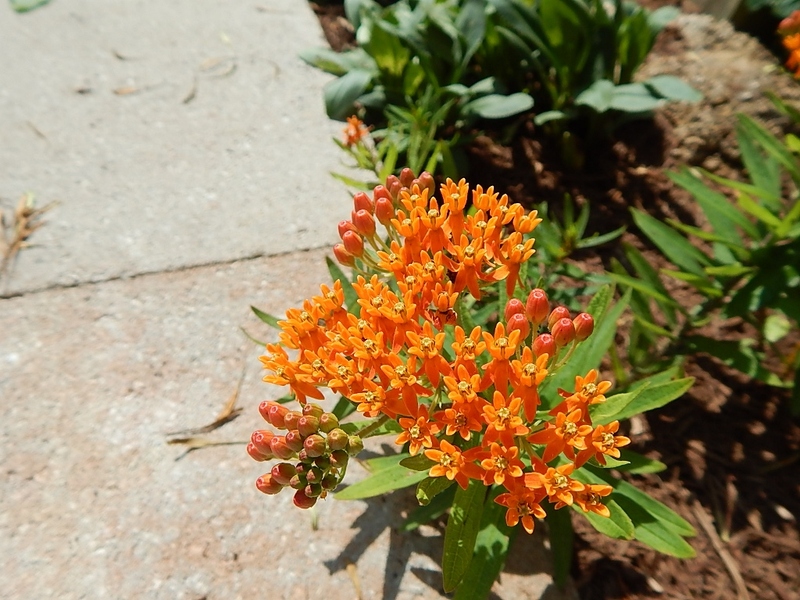 It attracts butterflies and works well in clay soil. Kobold is a compact version of liatris, and I am told this plant does not need staking, another bonus. 5. Foxglove (Digitalis). The tubular bells on this biennual are nothing short of amazing. 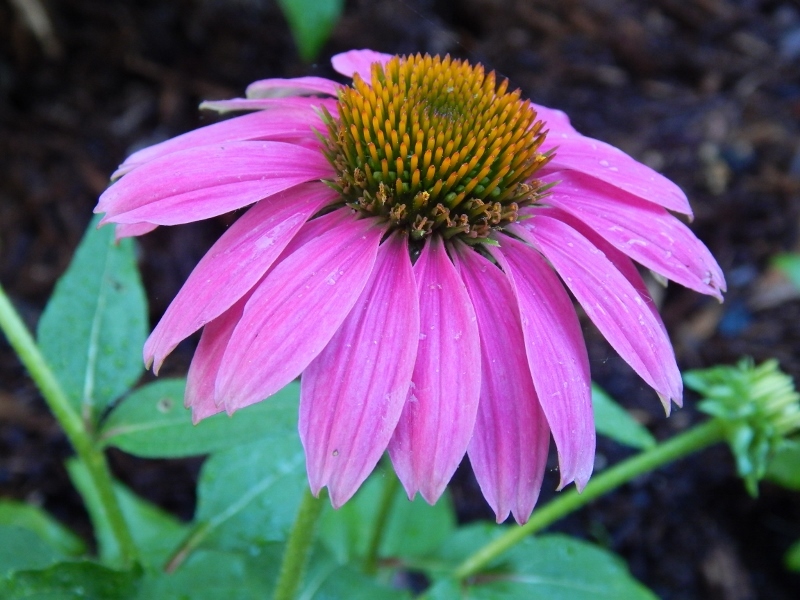 The freckles on the inside if the bloom spill forward on these charming flower spikes will be the perfect addition to my cottage garden. 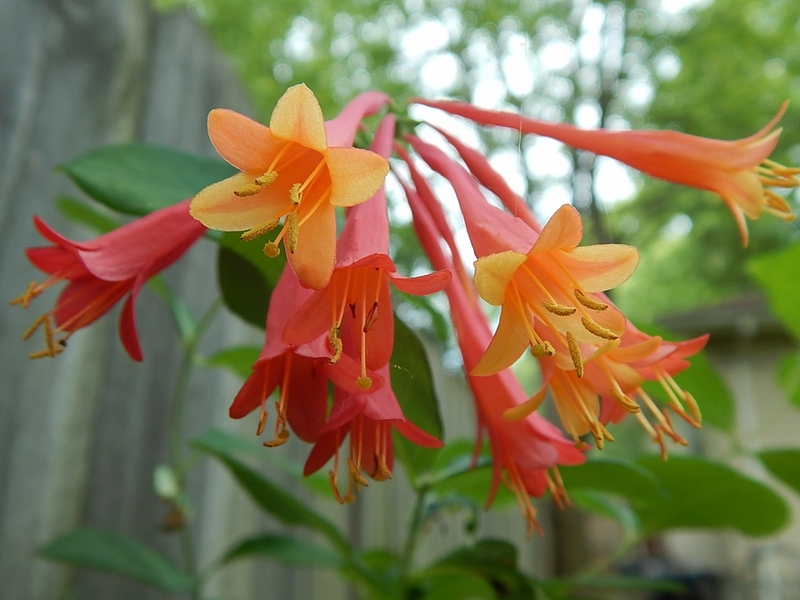 I grew them years ago in my backyard garden in Palatine, IL. Why I haven’t introduced them to my St. Louis landscapes escapes me. But that’s about to change. Categories: Inspirations, Musings, Plants, Uncategorized | Tags: alchemilla mollis, Andy Cohen, bee balm, Bravo TV, canna, Dorothy Benedict, hosta, kobold gayfeather, lady's mantle, liatris spicata, monarda, perennials, Russian sage, Stella De Oro daylily, tall garden phlox | Permalink.